Filet Mignon, the king of the steak cuts. Does it need anything special when cooked on a kamado style cooker? The answer is…kind of. Lets keep things simple. What makes kamado style grills such as our Kamado Joe so wonderful can also prevent us from cooking foods in standard ways. Steaks for instance. Since kamado grills hold heat so well, once you get the temperature up it’s near impossible to bring it back down in a reasonable amount of time. This means doing a quick sear on a thick cut steak then cooking it indirect is not going to happen on a Kamado Joe. 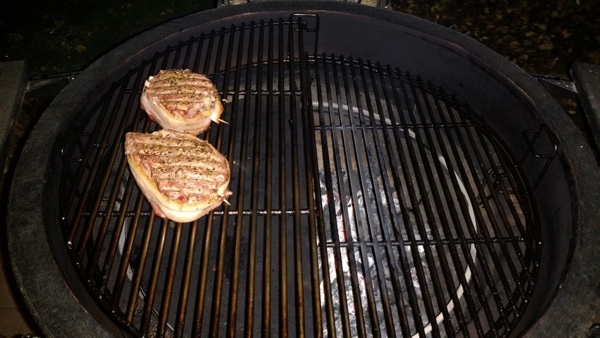 Luckily there still is a delicious way to cook steak on a Kamado Joe without starting with a flash sear. Its called a reverse sear. Lets get started. 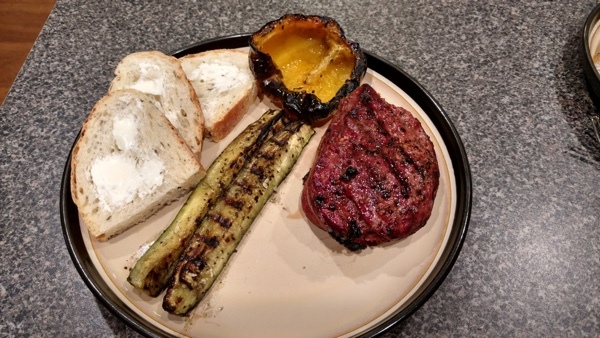 Were doing a quick dinner with some bacon wrapped filets, halved bell peppers and a quartered zucchini. 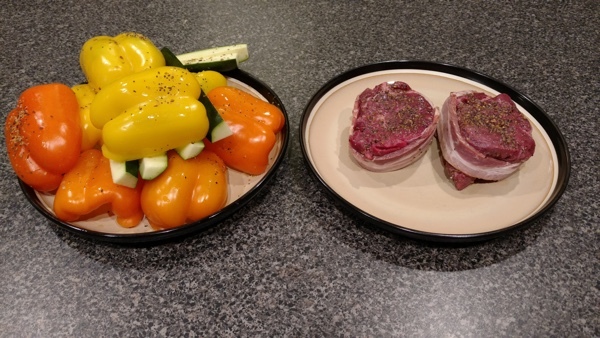 Top the steaks with your favorite steak seasoning or salt and pepper. 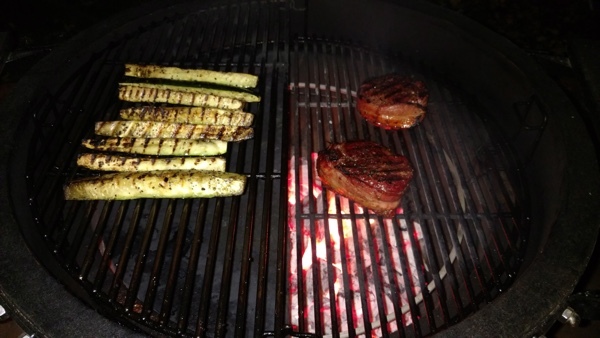 Our veggies were hit with olive oil and steak seasoning before hand. 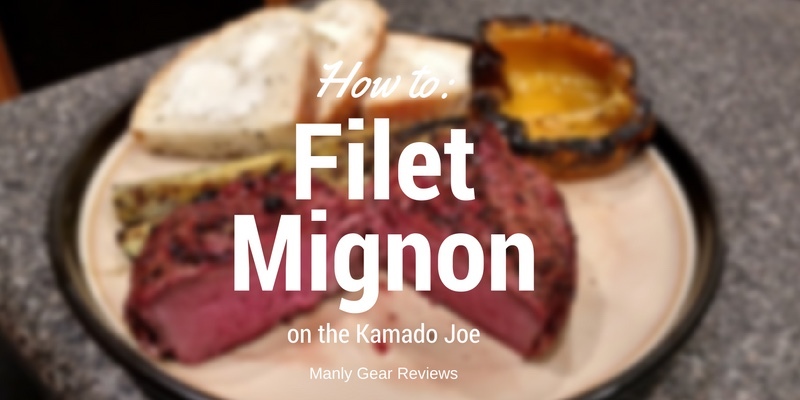 Once you heat up your Kamado Joe to 300-350 go ahead and put the filet mignons on the indirect side, or in this case over the heat diffuser plate. 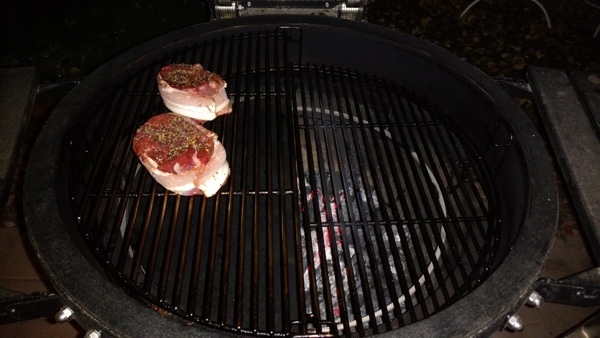 I use the diffuser plates 99% of the time as I like starting the fire in the middle of the Kamado Joe. Depending on how thick your steaks are, you may need to flip them half way through their journey to the magical 120 degree mark (if you want rare plus or medium rare after searing that is). These filets may look small but it’s just because they are on a Big Joe. Here we are, a perfect medium rare. 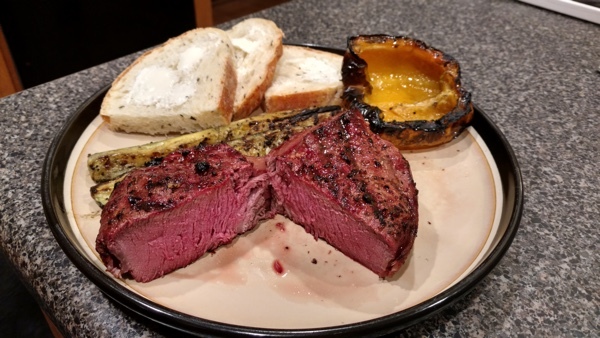 I personally have become a fan of the reverse sear as it allows that smokey charcoal taste we all know and love from the Kamado Joe to get into the steak before we finish it off with an awesome sear. Time to eat these steaks! manlygearreviews.com is a participant in the Amazon Services LLC Associates Program. © 2019 Manly Gear Reviews.